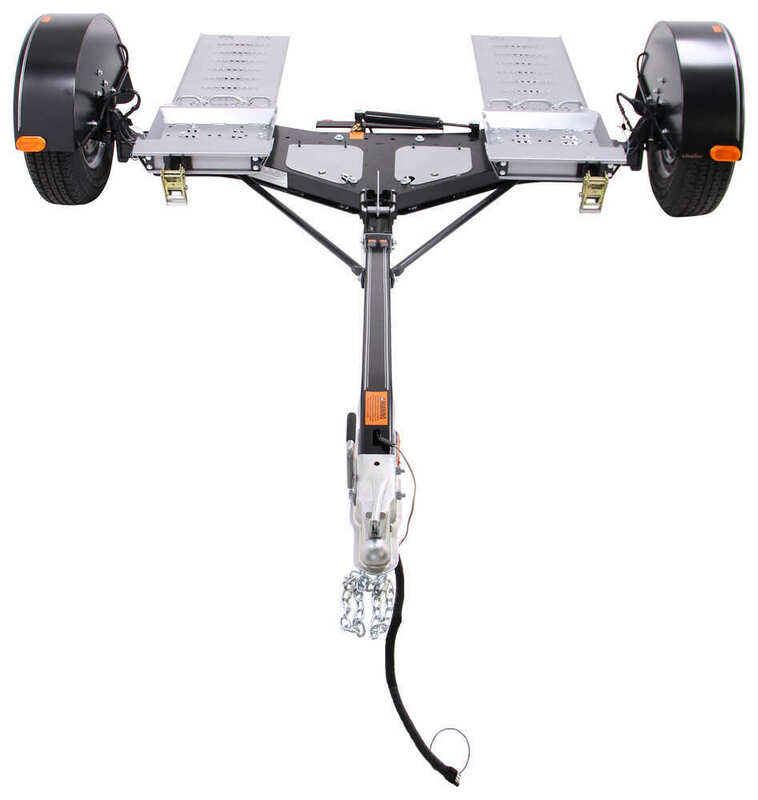 Yakima Rack and Roll Trailer - 78"
Tow your vehicle without installing a tow bar or base plates. 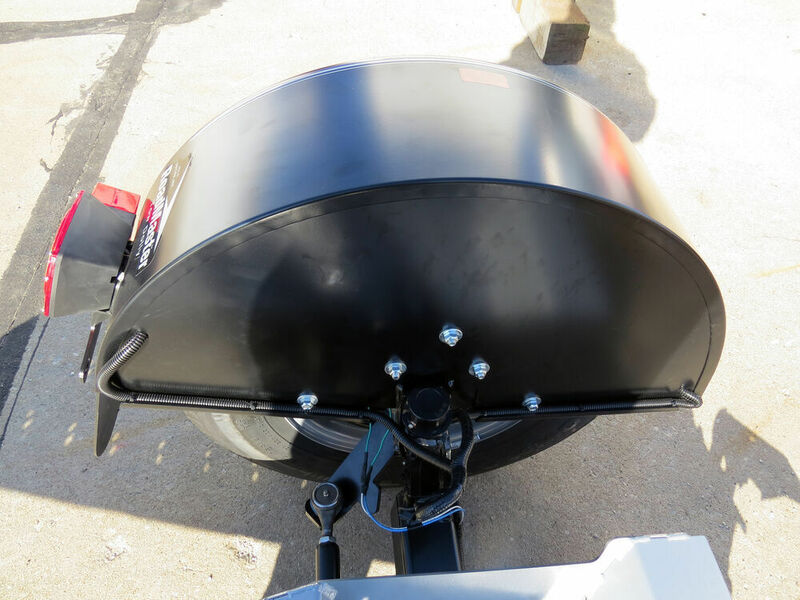 This tow dolly has self-steering wheels for superior maneuverability and electric brakes for safe stopping. 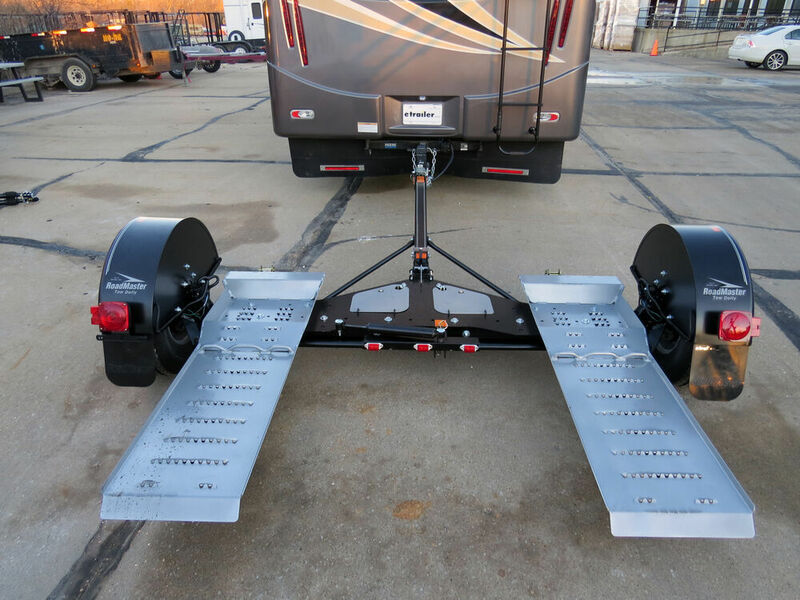 Adjustable axle positions and sliding ramps fit almost any vehicle. 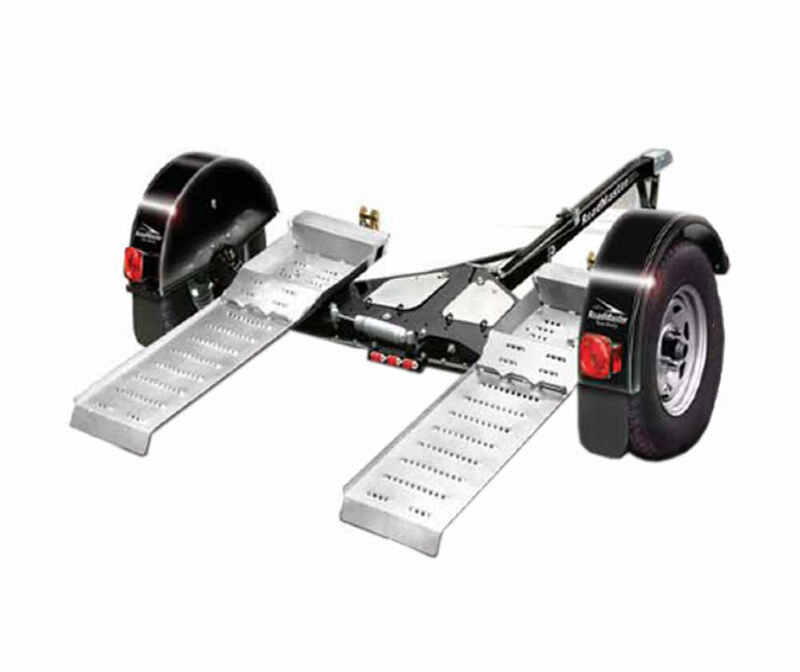 Lowest Prices for the best trailers from Roadmaster. 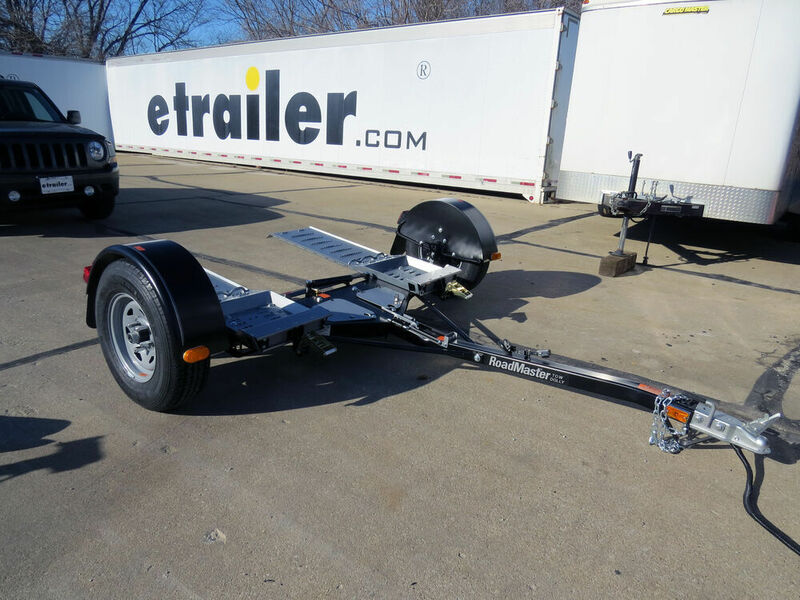 Roadmaster Tow Dolly with Self-Steering Wheels and Electric Brakes - 4,380 lbs part number RM-2000-1 can be ordered online at etrailer.com or call 800-298-8924 for expert service. 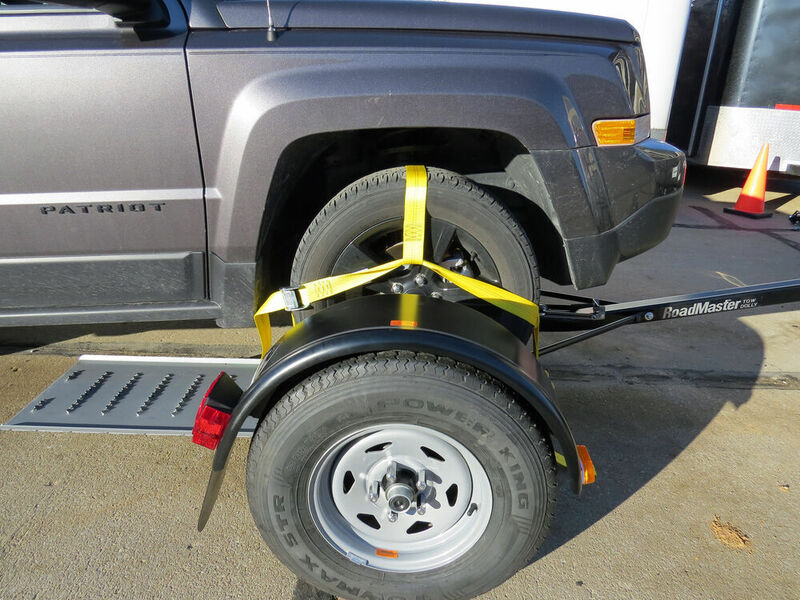 Tow your vehicle without installing a tow bar or base plates. This tow dolly has self-steering wheels for superior maneuverability and electric brakes for safe stopping. 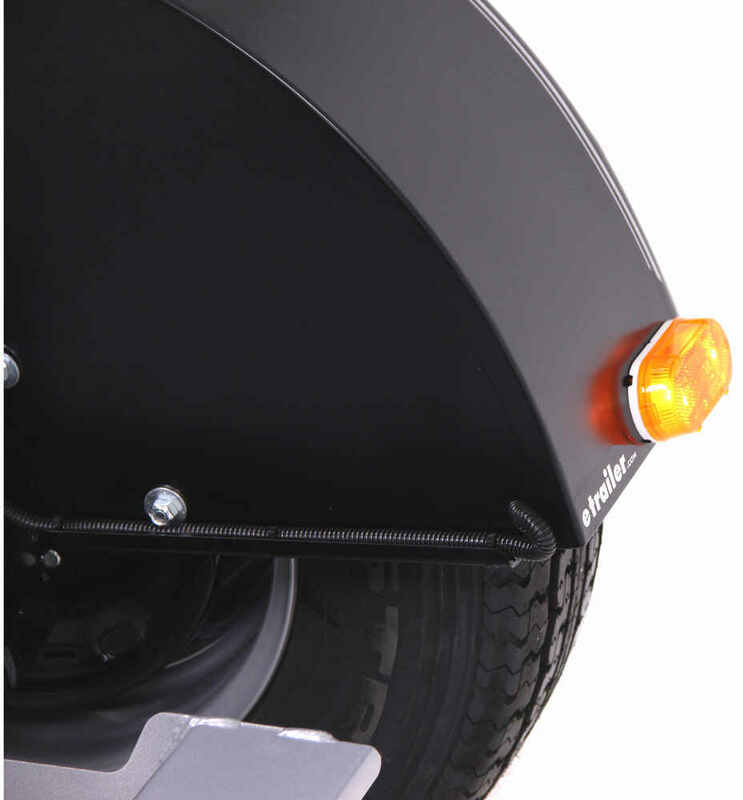 Adjustable axle positions and sliding ramps fit almost any vehicle. Distance from coupler center to axle center: 94"
Recommended ball height: 17" - 19"
When towing your vehicle with a tow bar, all 4 wheels are in contact with the ground. Certain vehicles - namely, those with front-wheel-drive automatic transmissions - require either a transmission lube pump system or a driveshaft disconnect when being flat towed. 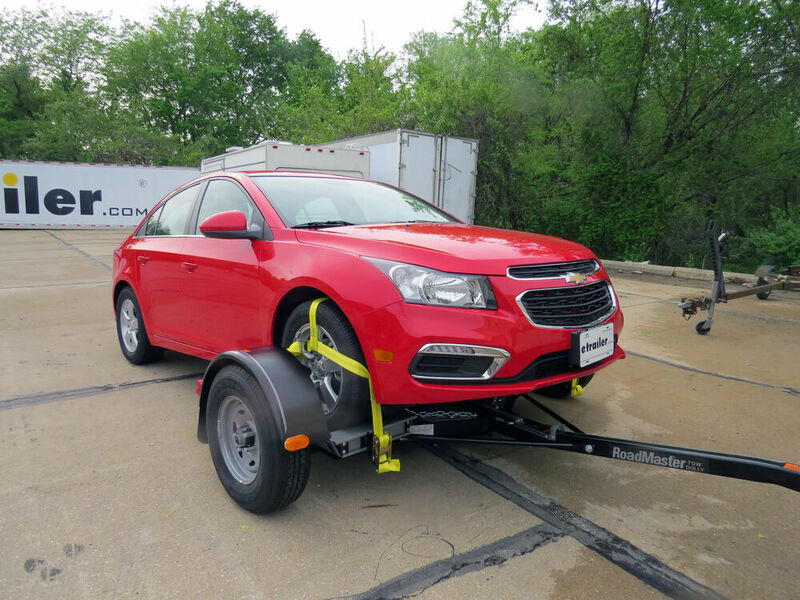 Using a tow dolly eliminates the need for those by lifting your vehicle's front wheels off the road. 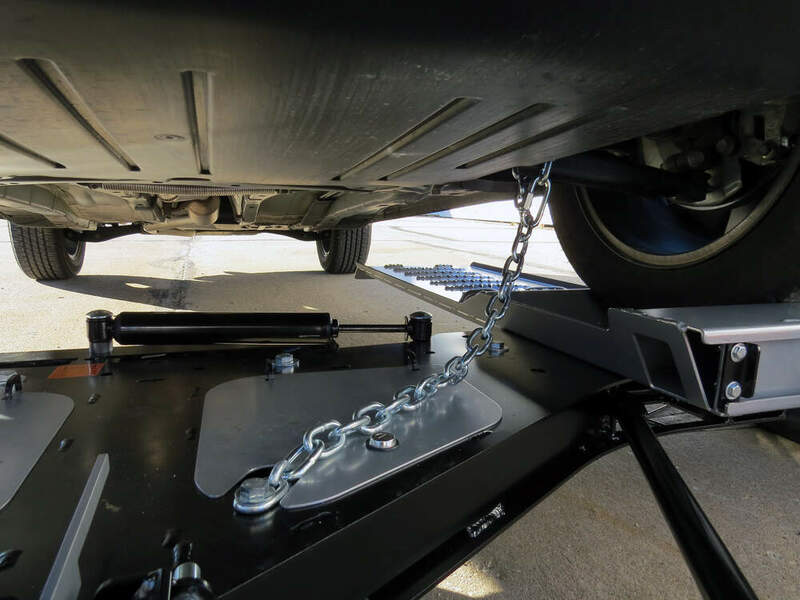 In addition, using a dolly eliminates the need for base plates that clutter the front of your towed car, difficult-to-install wiring, and a potentially expensive supplemental braking system. 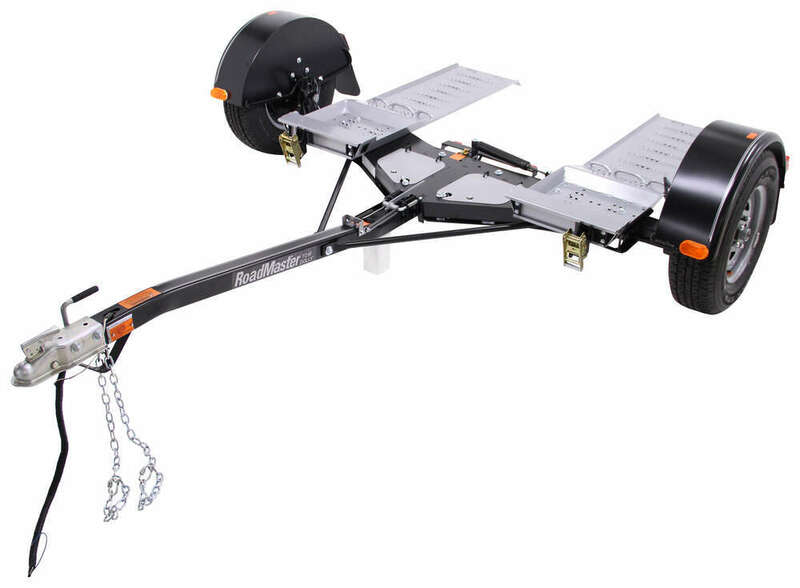 Also, if you want to tow multiple vehicles, this dolly is a great alternative to traditional flat towing because you don't have to purchase and install brackets and wiring for all of your cars. 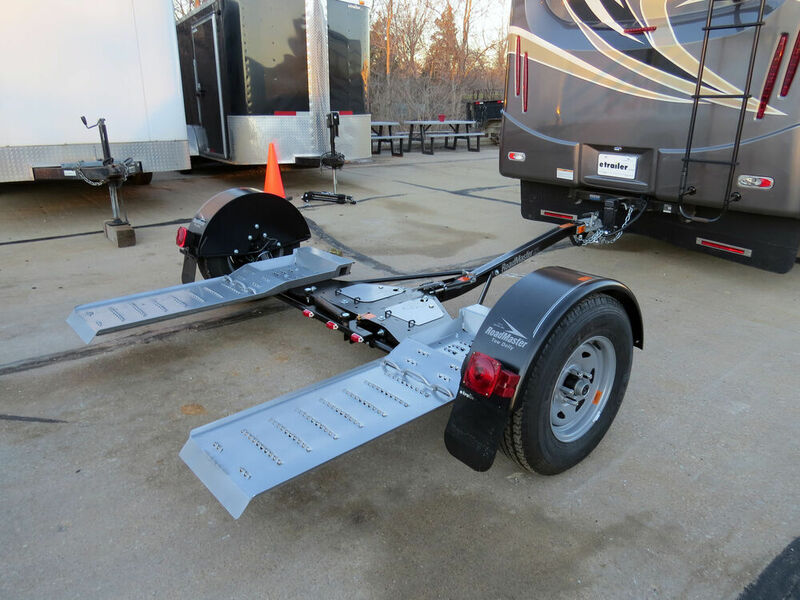 The built-in electric brakes make it safe and easy to stop your vehicle while you're towing. 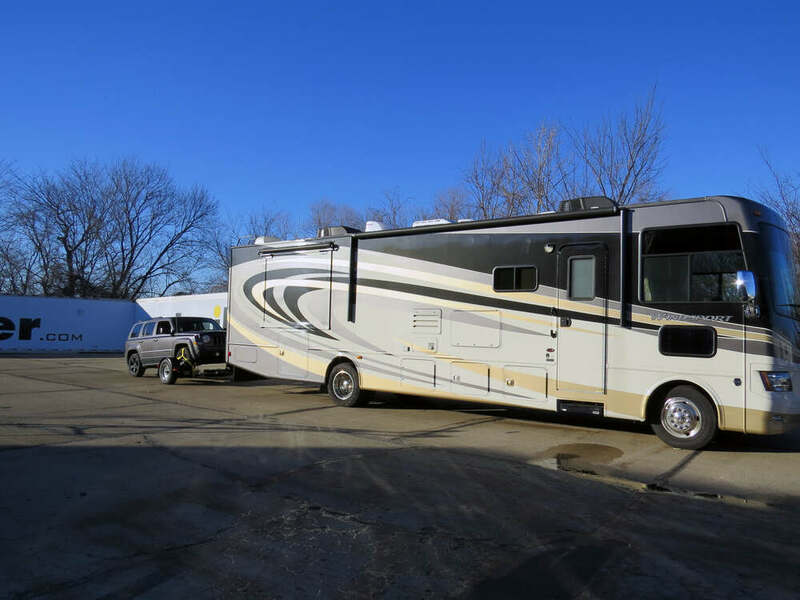 This meets towing requirements, and also helps prevent the extra wear and tear on your RV's brakes that would otherwise occur because of the added towing weight. An electric brake controller (sold separately) must be purchased and mounted inside your RV to complete the installation. 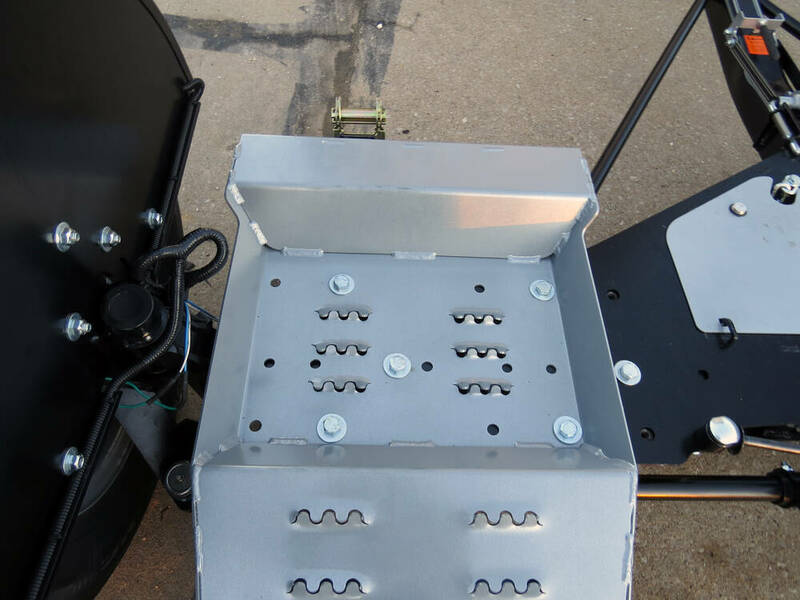 In addition, you will need to install a 6-way or 7-way trailer connector on the dolly so that it can receive the braking signal from your RV. 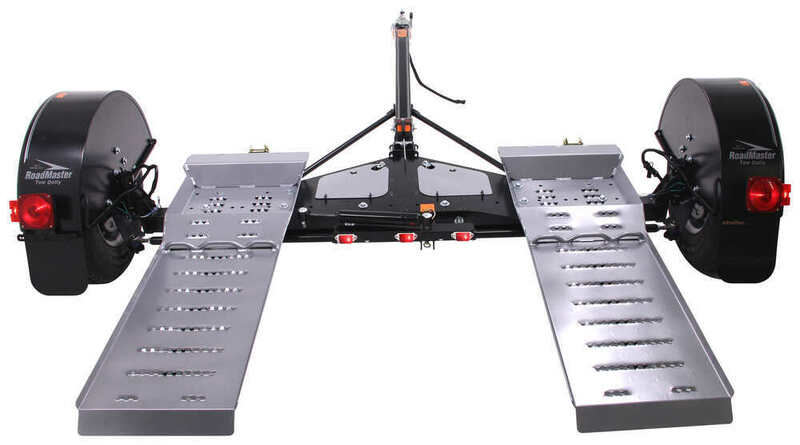 The sliding ramps offer a 36" range of adjustment to ensure a precise fit for almost any vehicle you decide to tow. Also, the included wheel nets adjust to fit tires that are up to 30" outer diameter x 11" wide. Laser-cut grooves give you extra traction while loading and unloading your vehicle. The self-steering wheels and stabilizer make the dolly more maneuverable around corners. 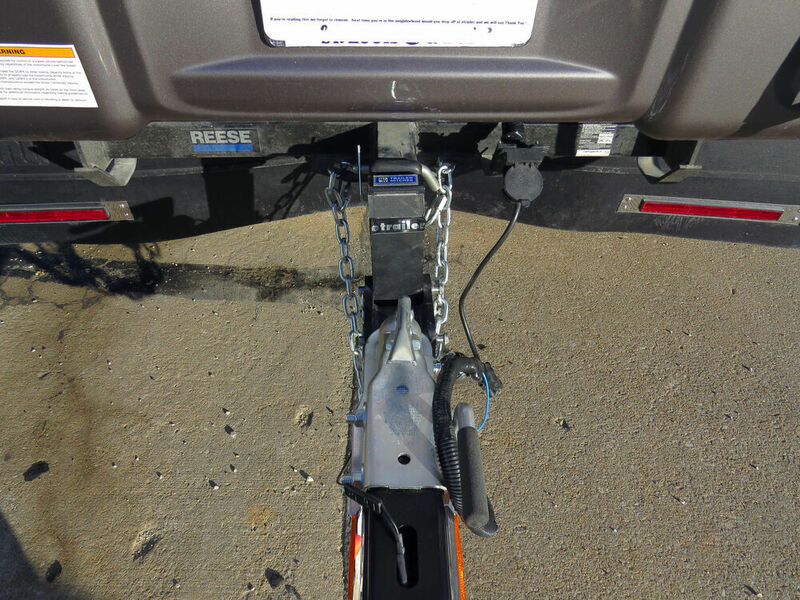 This keeps your towed vehicle safe and on course by allowing the dolly to better track your motor home. 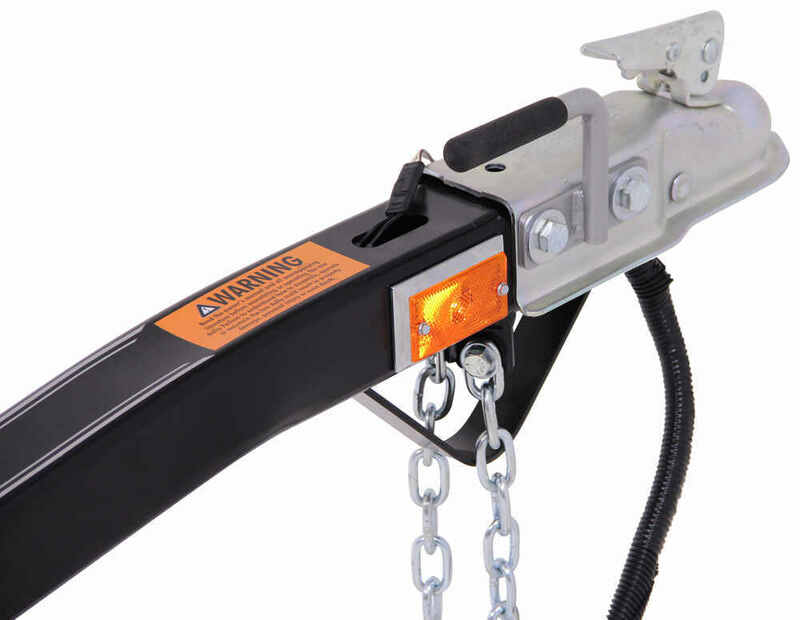 Once your vehicle is loaded onto the dolly, simply pull the steering safety pin out to engage the self-steering wheels. Be sure to put the safety pin back in if you tow the dolly without a load. 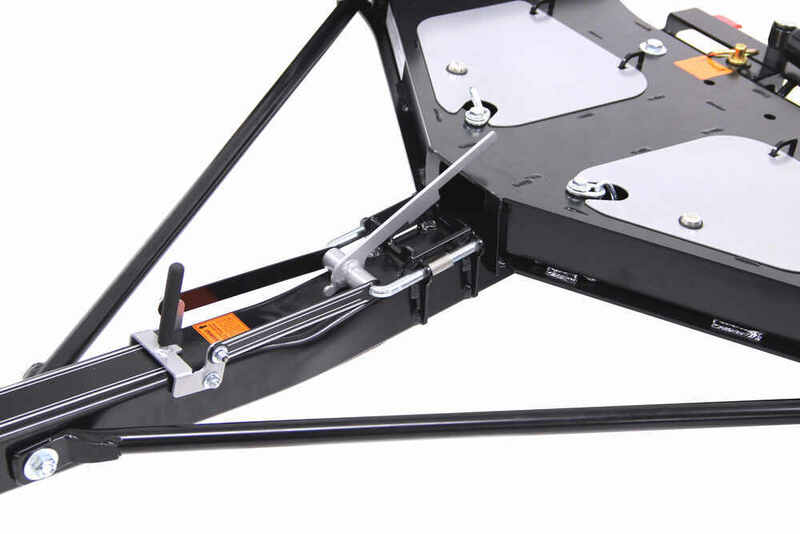 You will never again have to crawl under your car to tilt the bed of a dolly. 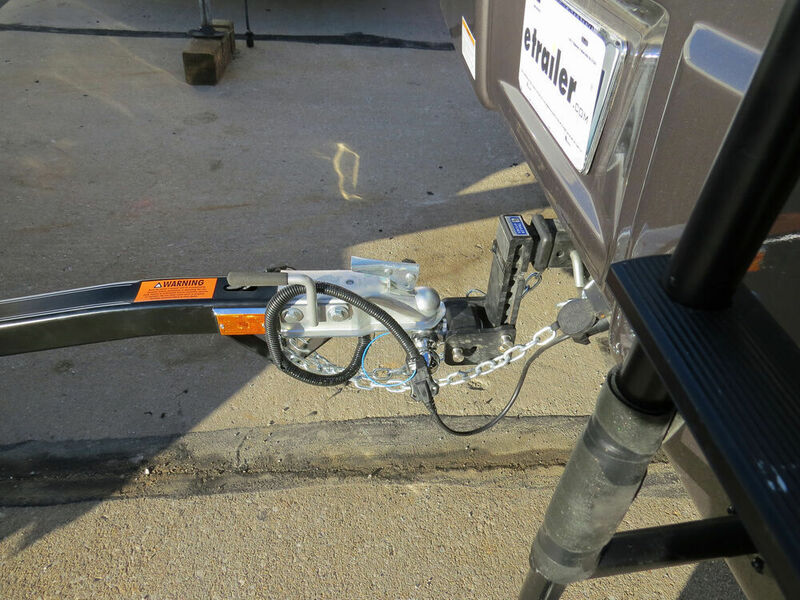 Roadmaster's tow dolly includes a conveniently located tilt release to make loading and unloading your vehicle even faster and easier. Stow tie-downs, wheel nets, tow lights, or any other accessories you decide to take along with you in the dolly's handy storage trays. 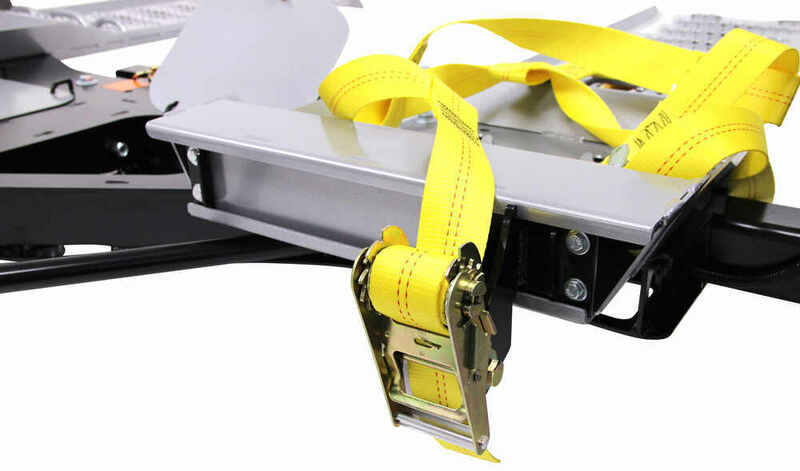 Both compartments lock securely using the same key and are located near the front of the dolly for quick and easy access, even while the car is being towed. 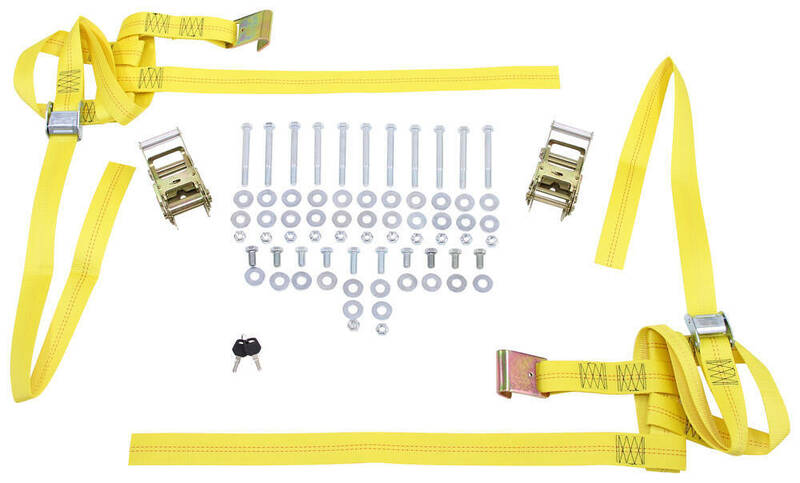 Tow your Ford F-53 without installing a tow bar or base plates. This tow dolly has self-steering wheels for superior maneuverability and electric brakes for safe stopping. 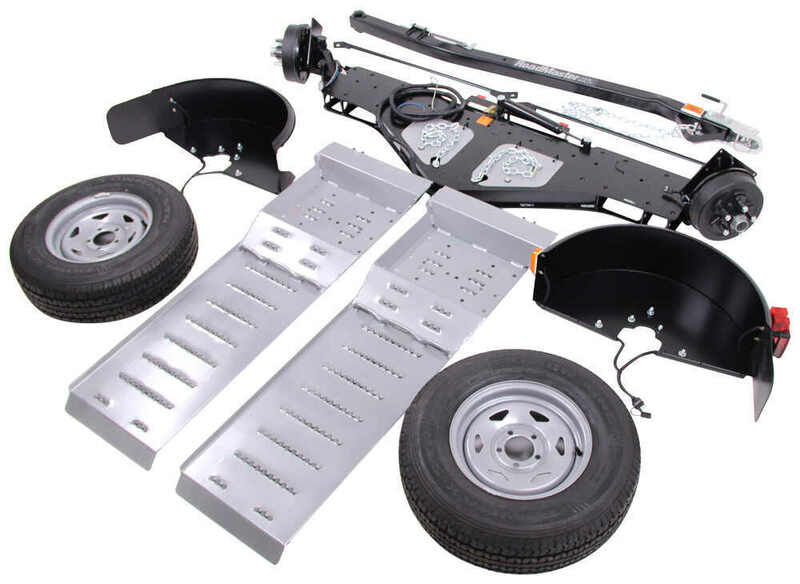 Adjustable axle positions and sliding ramps fit almost any Ford F-53. This compact trailer lets you haul 400 lbs of gear, including canoes, kayaks, SUPs, and cargo boxes. 58' crossbars offer plenty of space to mount accessories and provide anchor points. Marine-grade galvanized steel resists corrosion. 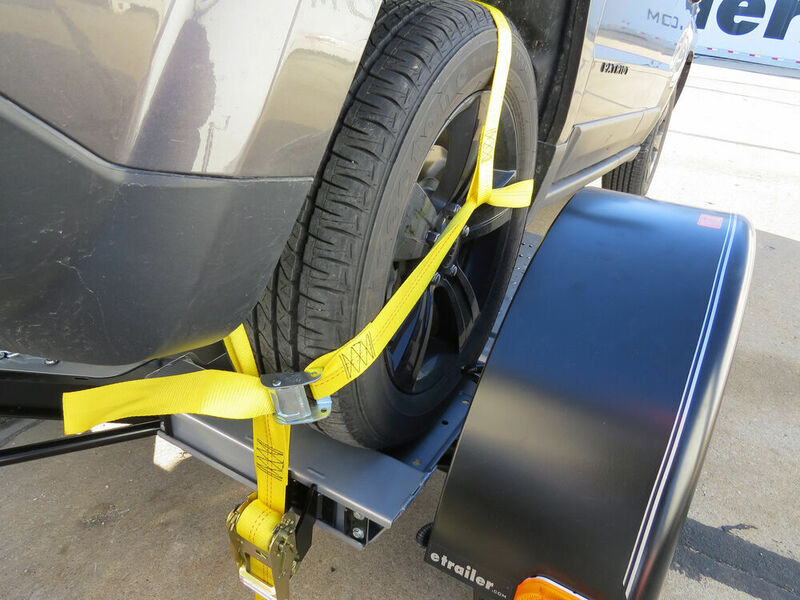 Tow your vehicle without installing a tow bar or base plates. 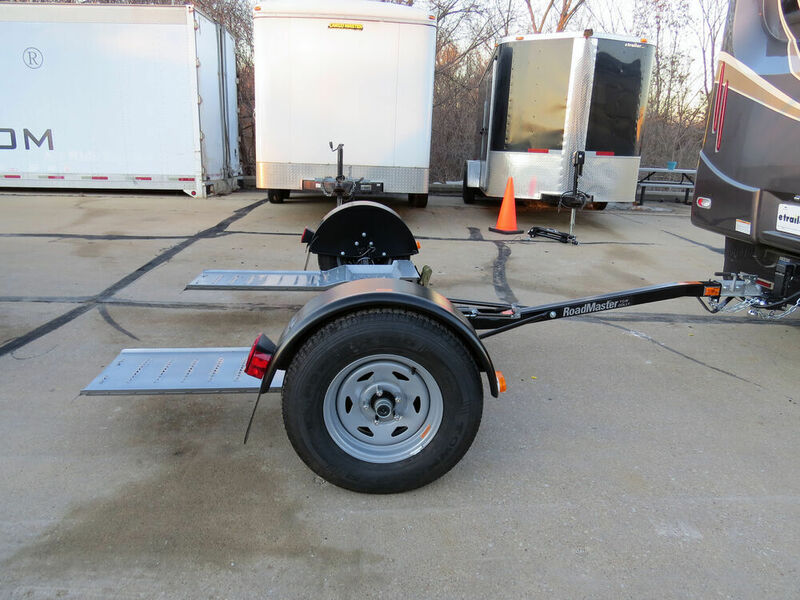 This tow dolly has a pivoting deck for easy maneuvering and electric brakes for safe stopping. 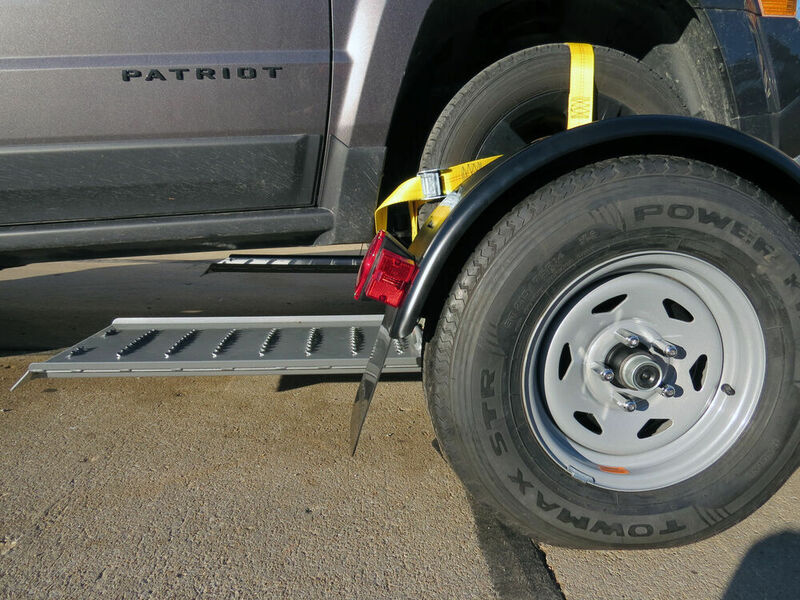 Sliding ramps adjust side-to-side from 34" to 77" to fit most vehicles. 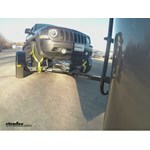 Tow your vehicle without installing a tow bar or base plates. 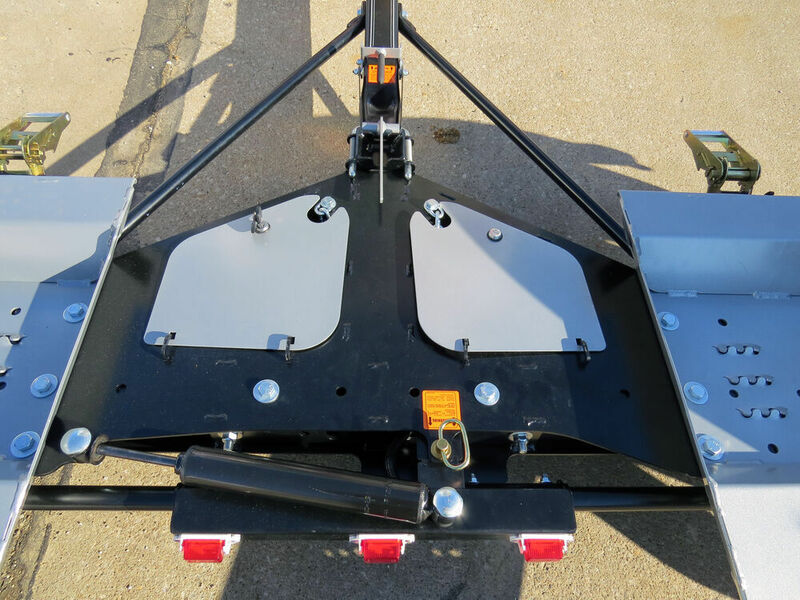 This galvanized tow dolly features hydraulic disc brakes for safe, controlled stopping and a tilt bed frame for easy loading. Fits towed vehicle tread width between 42" and 76". 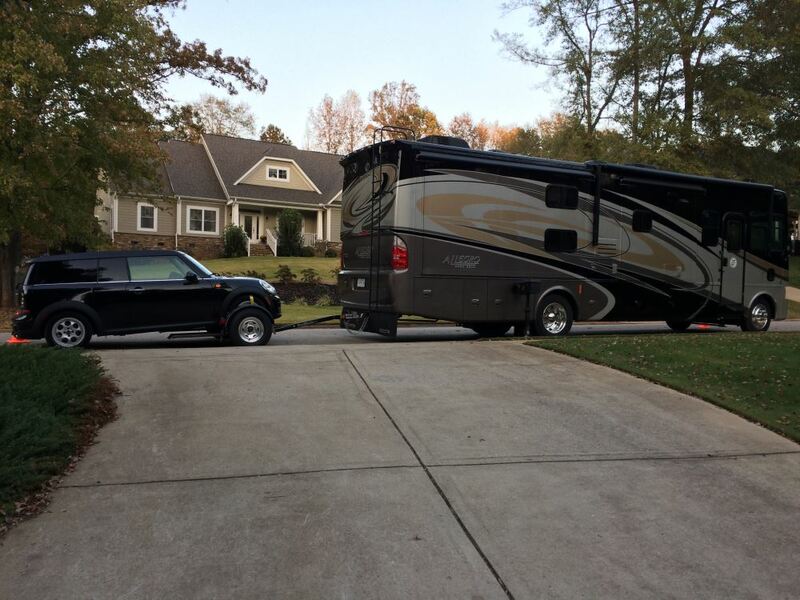 Here you see it being pulled behind an RV. 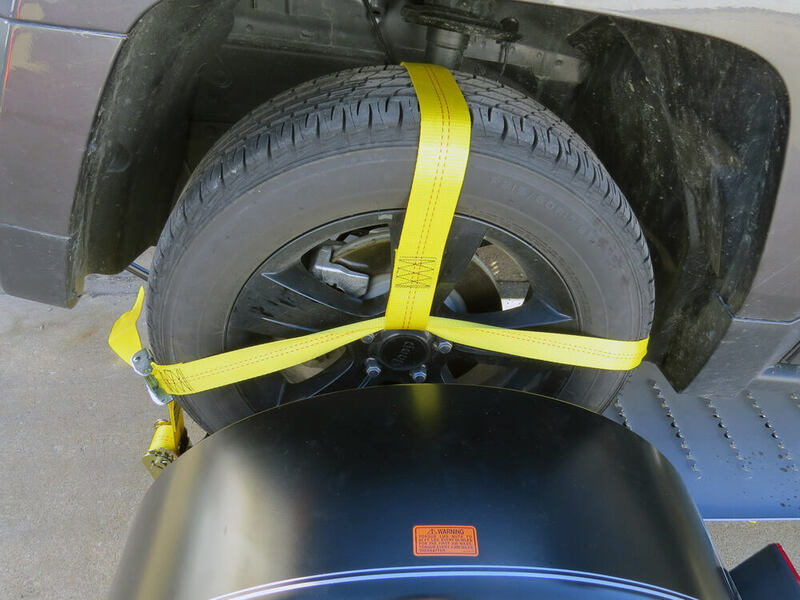 The front tires are strapped down, securing the vehicle to the tow dolly, while the vehicles rear tires are free to spin. The tow dolly provides a smooth ride, even around corners. 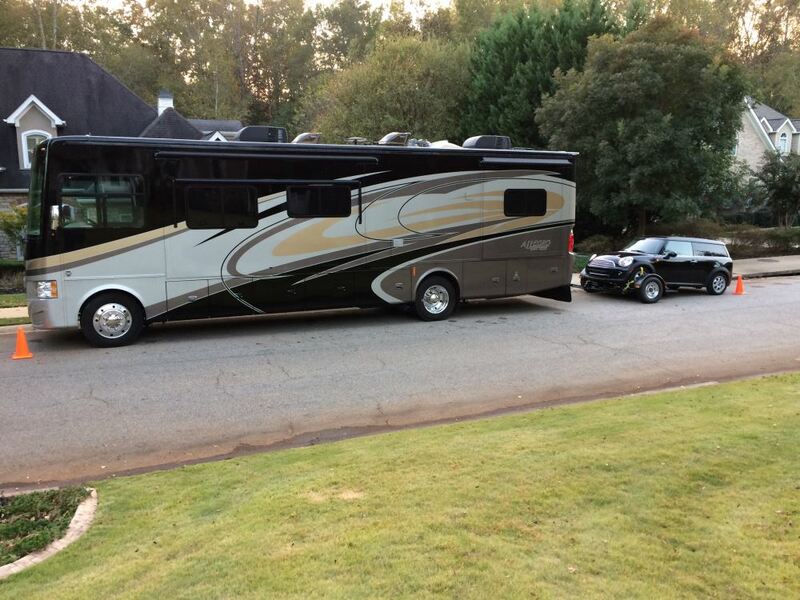 Note how the tires track with the RV as it turns. 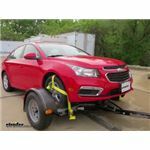 Order: RelevanceNewestRating - High to LowRating - Low to High Tow your vehicle without installing a tow bar or base plates. 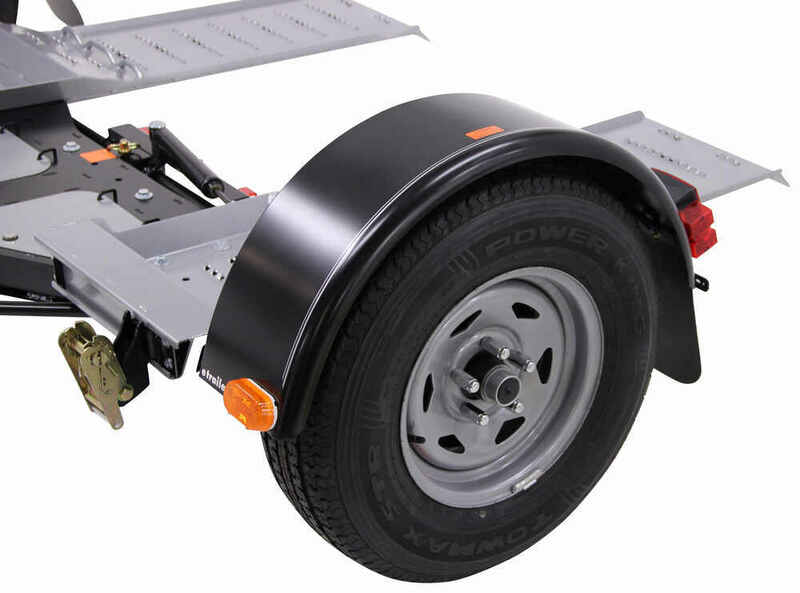 This tow dolly has self-steering wheels for superior maneuverability and electric brakes for safe stopping. 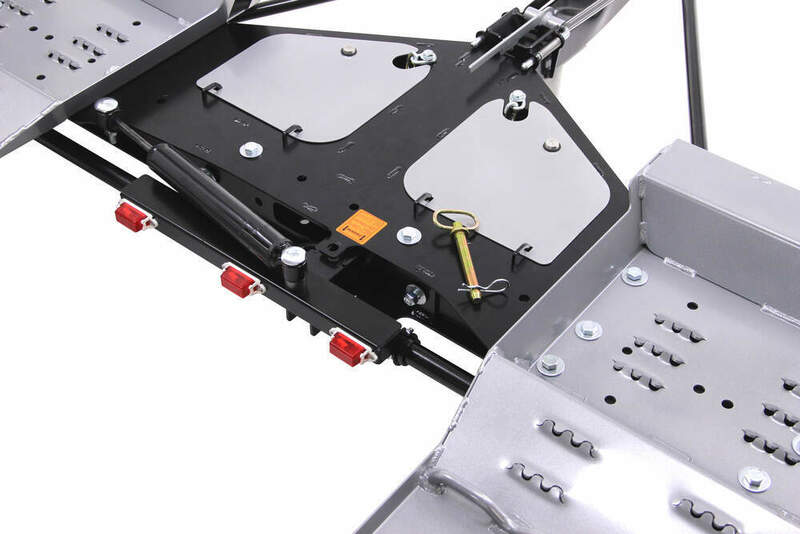 Adjustable axle positions and sliding ramps fit almost any vehicle. Do you have a question about this Trailer? 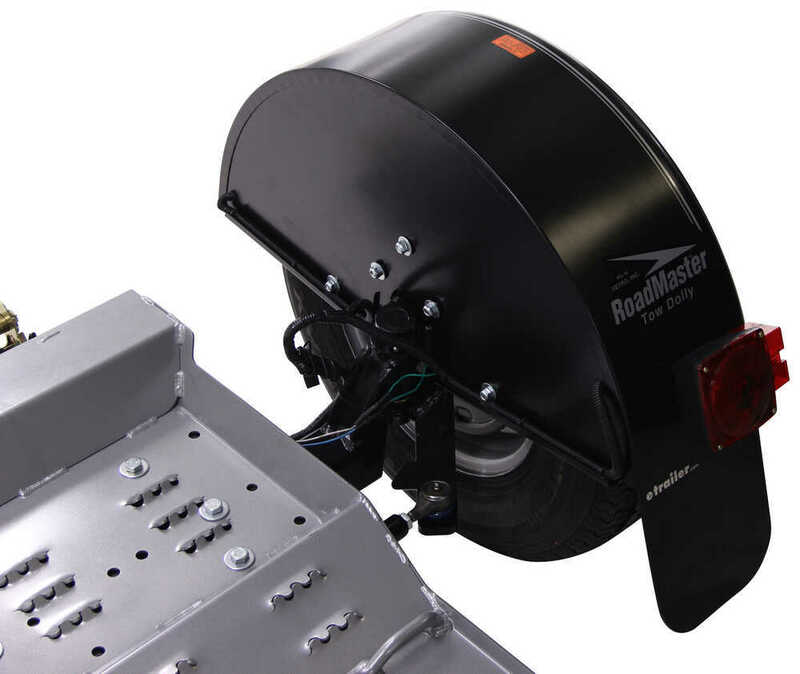 We do offer some replacement fenders for a Roadmaster Tow Dolly. 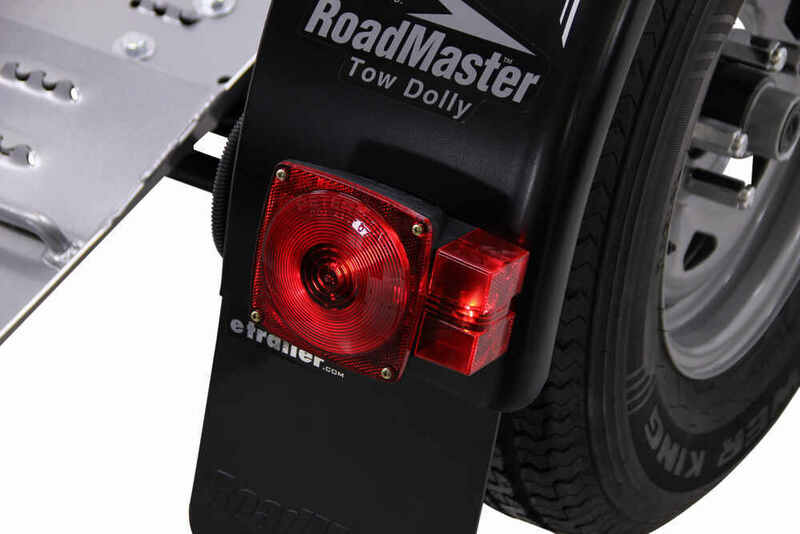 If you have a Roadmaster Tow Dolly # RM-2000-1, you will use # RM-921003 for the passenger side and # RM-921002 for the driver's side. 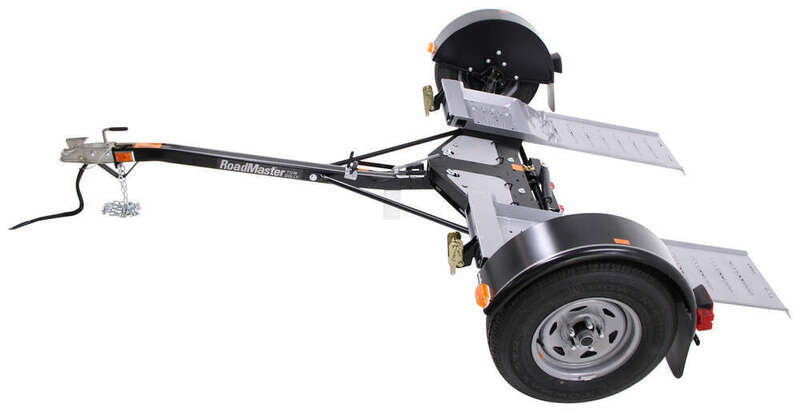 If you have the Roadmaster Tow Dolly # RM-2050-1 with electric brakes, then you will use # RM-922005 for the passenger side and # RM-922004 for the driver's side. The stabilizer bar, part # RM-921006, is 42 inches end to end and 40 inches from the bolt holes center on center. 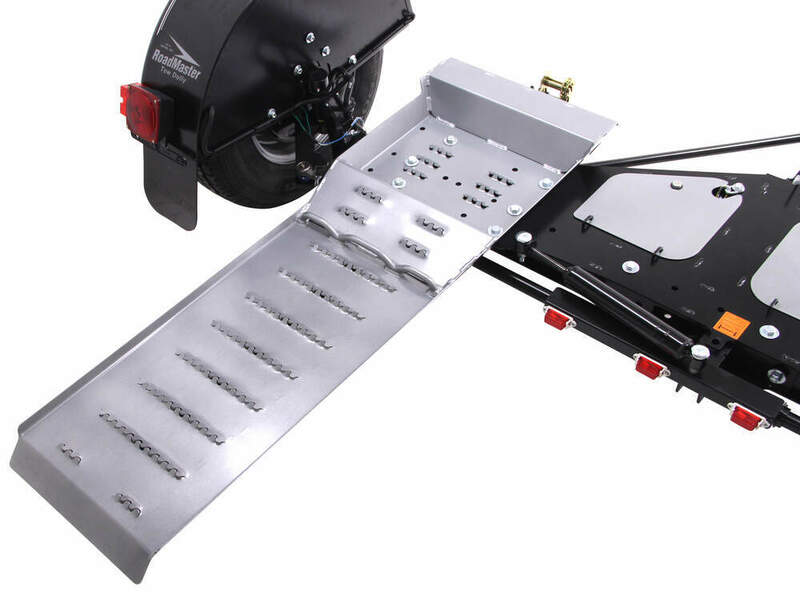 It's specifically designed to work on the Roadmaster dolly, part # RM-2000-1. Can I Flat Tow A 2018 Equinox AWD? 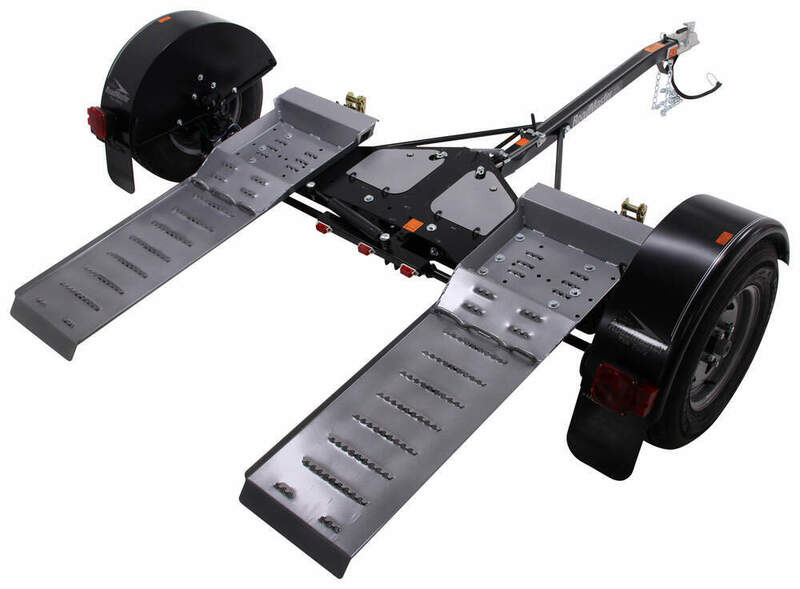 Highest quality trailers for the best price. 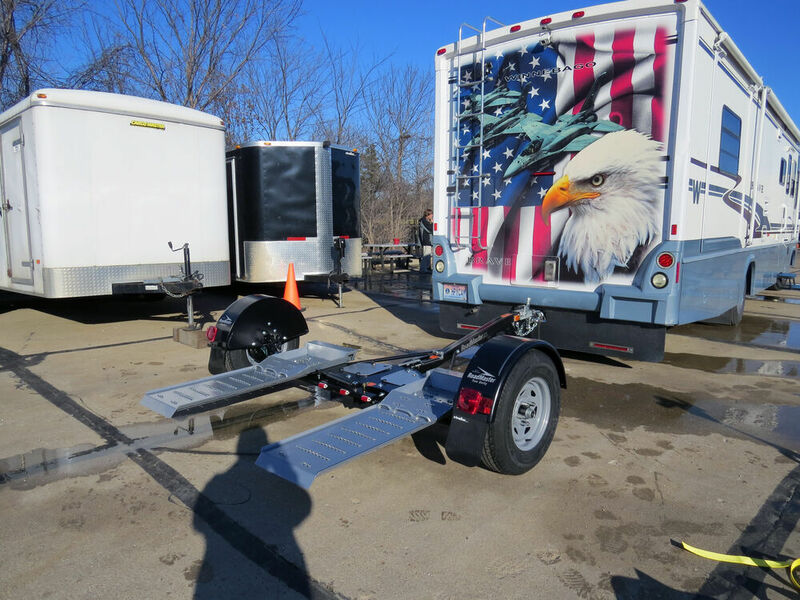 Most detailed, accurate trailer information available. I just had to write to let you know how very satisfied I was to receive your products. Within an hour or so everything was mounted and functional. Everything fit perfectly and with very little effort. I will recommend your site to all my friends who have a trailer need. Thank you very much indeed.